The California Energy Commission (CEC) announced that it will hold an evidentiary hearings for the proposed Calicor Solar power project on 4 August beginning at 12 noon. The hearings may extend into 5 and 6 August, as well. The hearings will be held in Barstow -- details copied at the bottom of this post below. You can also find the details at the CEC Calico Solar site here. As noted in previous posts on the Calico Solar power project, the impact of the project on wildlife in the Mojave Desert will be significant. The site is home to dozens of desert tortoises, Mojave fringe-toed lizard, and foraging habitat for bighorn sheep. Wednesday, August 4, 2010, 12:00 noon, and continuing into the evening hours, if necessary. Thursday, August 5 and Friday, August 6, 2010, beginning each day at 9 a.m.
Could CDPA 2010 Hitch a Ride With Another Sensible Renewable Energy Bill? I keep coming back to the prognosis for the passage of the California Desert Protection Act of 2010 (CDPA 2010, or S.2921) because even if I am pessimistic about its chances, I know Washington is an unpredictable arena where one has to keep an eye open for opportunities. Part of me believes CDPA 2010 is unlikely to be considered by Congress this year. As I've noted in previous posts, Senator Feinstein's proposed CDPA 2010 is still stuck in the Senate Committee for Energy and Natural Resources, and Congress has plenty of business to consider in a relatively short amount of time, meaning that the bill faces an uphill battle. "The last word in ignorance is the man who says of an animal or plant: "What good is it?" If the land mechanism as a whole is good, then every part is good, whether we understand it or not. If the biota, in the course of aeons, has built something we like but do not understand, then who but a fool would discard seemingly useless parts? To keep every cog and wheel is the first precaution of intelligent tinkering." The Kelso Depot in the Mojave National Preserve is hosting a photo exhibit featuring pictures taken by high school students of desert tortoises in the Mojave. The exhibit runs from early May until 7 August, so you still have a couple of weeks left to check it out. According to the minutes from the San Bernardino County Board of Supervisor's meeting from 13 July, the County approved a position requesting that Federal Agencies avoid purchasing private land for conservation purposes, and also requested that additional land be set aside for Off-Highway Vehicle (OHV) use. At the end of the day, the San Bernardino County Board of Supervisors showed just how short-sighted their policy decisions are, and supported a subsidy for corporations that are swallowing up open space and desert wilderness for their own profit. According to a letter submitted by Solar Millennium, the company has asked the California Energy Commission (CEC) to temporarily suspend the application review of its proposed Ridgecrest Solar Power project. As noted previously on this blog, the Ridgecrest Solar power project could fragment critical Mohave Ground Squirrel habitat and harm a healthy desert tortoise population. A proposal to construct a 3 Mega-Watt solar power station in Newberry Springs--which was conditionally approved by the San Bernardino County Planning Commission earlier this year--is drawing opposition from neighbors who contend that the Rural Living zoning of the area should preclude industrial scale solar projects. 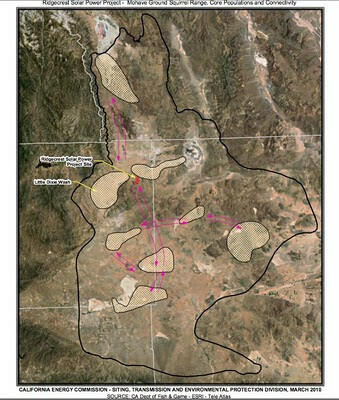 The site, which would encompass 80 acres and would be built by Solutions for Utilities, is located among disturbed and fallow agricultural land west of the proposed Calico Solar Power project site. 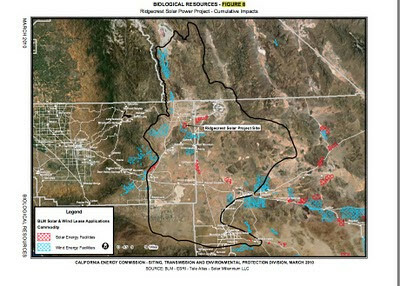 The opposition to the Solutions for Utilities project brings attention to a developing angle in the "solar rush" taking place in the Mojave--pressure placed on rural communities to accept the industrial scale development that should not occur in pristine wilderness, but that would disrupt quality of life in more populated areas.